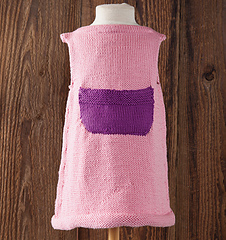 Easy to make and wear this dress is a great staple for every little girls wardrobe. 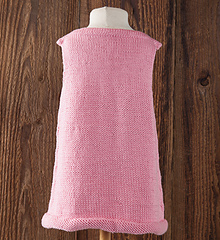 A large pocket with button, boat-neck neckline and reverse stockinette stitch on hem are simple embellishments. Sizes are 6m ,12m, 2y, 3y, 4y, 5y, 6y, & 8y.